Asbestos, carcinogens, finely divided silica, active pharmaceutical products and soot; all examples of dusts hazardous dusts that need to be cleared with specialist equipment. Anderson Trade takes a look at the options in H-Class vacuum cleaners. DERBY, England - Dec. 11, 2018 - PRLog -- Certain dusts are hazardous to health if inhaled. In environments where such dusts are present and need to be cleared, highly specialist equipment is required. Here Anderson Trade, nationwide suppliers of commercial and industrial cleaning machines, look at H-Class vacuum cleaners, and the options when it comes to choosing from the models available. "H-class vacuum cleaners are purposely designed for use with hazardous dusts. They are built to safely and effectively pick up toxic dust and debris in a safe manner," says Anderson Trade. "H-class vacuum cleaners have three stages of filtration. The first is a sealed, disposable paper bag. The second is a high efficiency cloth filter, and the third is a HEPA (High Efficiency Particulate Air) cartridge. All hazardous dust vacuum cleaners are tested in line with British Standard BS5415 to ensure they achieve a filtration efficiency of at least 99.97 per cent." 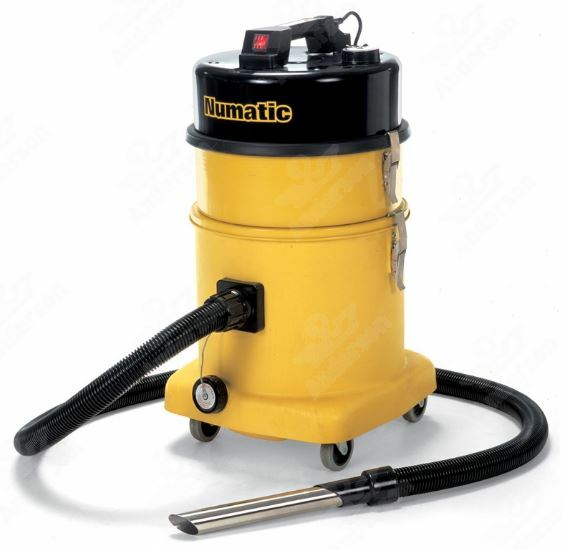 Numatic manufactures a range of specialist hazardous dust vacuum cleaners in a variety of capacities up to 40 litres, and with a choice of Twinflo single 1200 Watt or double 2400 Watt motors built into an all-steel, low-noise power head. All models are available in both 240 volt and 110 volt options and feature a HEPA filter with a primary pre-filter and microflo dust bags to meet the required filtration efficiency. "The Numatic HZ200 and HZ250 are the smaller models in the range. These have a 10 litre steel container. "In the small to medium range, featuring a 15 litre polypropylene container, are the Numatic HZ350 and HZ370. "The Numatic HZD570 is a medium sized model offering a 23 litre super tough structofoam container. For higher capacity needs, the Numatic HZ750 single motor and HZD750 twin motor models offer a 35 litre steel container. "When even greater capacity is called for, the Numatic HZ900 single motor and HZD900 twin motor offere a huge 40 litre container." Anderson Trade points out that all Numatic hazardous dust vacuum cleaners come with an accessory kit including a 2.5 metre hose, small and large dusting brushes, a steel gulper, a crevice tool, 10 disposable paper bags and 20 polythene sacks. Anderson Trade is a nationwide stockist of a variety of commercial and industrial vacuum cleaners including H-class machines purpose-designed for handling all types of hazardous dust. Anderson Trade offers a free, personalised onsite demonstration, allowing organisations to ensure they select the right model to suit their unique needs. The company also stocks a comprehensive range of parts and spares for all leading brands of commercial and industrial vacuum cleaners. To learn more visit https://www.anderson-trade.co.uk/catalogsearch/result/?cat=0&q=hazardous+dust or call 01332 347 557 for bespoke advice.